Planning for your next holiday in 2019? Here are some of the latest Malindo Air flight deals and promotions to help you save on airfare. Conditions: Promo prices are available until sold out. Prices are valid as of 1 February 2019 and may not always be available. Book by 3 Feb to avail of the deals. Bookmark this page – we’ll be updating it regularly! The striking amalgamation of culture in Kuala Lumpur is fascinating, evident in its sprawling hawker centers and everyday life. Well-preserved colonial buildings, majestic religious sites and enormous skyscrapers makes the city an architectural wonder. The significant presence of well-constructed green spaces consisting of lakes, botanical gardens and eco parks further accentuate the beauty of KL, as the locals call it. The historic Penang prides itself as the most diverse and multicultural state in Malaysia. Mosques, churches, and temples stand tall along meticulously restored shophouses and clan mansions. Its toothsome food stands true to its recognition as the street food capital of Malaysia, while its breathtaking hills, national park, fishing villages and durian farms makes Penang completely unforgettable. Prices for Penang flights are cheapest in March, where the average price is $64 as of February. With about 107 flights per week from Singapore, ticket prices hits their peak in December and February. Hailed as the industrial hub of the Tamil Nadu state, the city of Tiruchirapalli in India bustles with bazaars and sprawling commercial centres. Behind the heaving city lies its enigmatic temples, inviting crowds from all over the world for pilgrimage. A handful of well-preserved British churches all over the ancient city will amaze any history and pilgrim enthusiasts. Peaking in May, December and January, prices for Singapore to Tiruchirapalli flights are cheapest in June, where the average price is $197 as of February. Kathmandu distinguishes itself as a popular stopover point for trekkers who are heading towards the Everest. The city, however, stands out on its own, with 10 UNESCO World Heritage Sites sprawled over it. Home to one of the most important Buddhist pilgrimage sites in the world, Kathmandu not only entices pilgrim travellers, but also architecture lovers, who will be rewarded with majestic temples, stupas, statues and fountains. With 2 airlines currently flying direct, Prices for Kathmandu flights peak in January and the cheapest month to find deals is May, where the average price is $362 as of February. While Kota Bharu serves as the popular stopover point for tourists who are heading towards the Perhentian Islands, the quaint capital city of Kelantan offers a variety of attractions. Historical market, colonial buildings, museums, palaces and mosques encapsulate the rich history of the city, while the authentic cuisine of East Coast Malaysia will delight your tastebuds. Being a coastal town itself, Kota Bharu is home to tranquil fish villages, rivers, and beaches. The cheapest month to fly from Singapore to Kota Bharu is March, where the average price is $123 as of February. Bandung’s heaving city makes a perfect base for its countryside delights. Its elevated location invites locals and tourists alike to its volcanoes, tea plantations, mountains, and waterfalls. For the urban wanderers, the Paris of Java offers a thriving arts, heritage, and fashion scene, evident in its museums, folk centre, colonial buildings and shopping streets. Prices for Bandung flights peak from November to January and the cheapest month is May, where the average price is $105 as of February. Prices for Kochi flights peak in January and February and the cheapest months are from March to July, where the average price is $212 as of February. 3 airlines fly direct to the destination. The capital of Kerala promises heavenly nature with its tea, coffee, and spice plantations, beaches, rivers and unsoiled jungles. Dubbed as the ‘Evergreen City of India’, Thiruvananthapuram also invites history and architectural enthusiasts with its ancient shrines as well as historical museums and palaces. Its vibrant arts and culture scene proves that the city is a beautiful mix of contemporary and tradition. With an average flight time of 4 hours, Singapore to Thiruvananthapuram flights peak in Decmeber. The cheapest month is April, where the average price is $228 as of February. A destination not to be missed by any kind of traveller, the idyllic island of Bali promises sandy beaches, intricate rice terraces, holy temples and ancient cultural villages. Also known for its volcanic mountains as well as meditation retreats, the effortless beauty of Bali will leave you with the fondest memories. With 12 direct airlines and 140 flights per week, prices for Bali flights from Singapore are stable throughout the year and the cheapest months to find deals are from March to April, where the average price is $121 as of February. Often hailed as one of the food havens in Pakistan, Lahore entices visitors with its culinary delights along its bustling street markets. The cultural center of Pakistan leaves history lovers and urban explorers in awe with its Mughal remnants, stunning mosques, museums, palaces and a well-restored old town. The historical gardens and parks add to its charm, a city that you’ll truly never forget. Prices for Singapore to Lahore flights begin to pickup in October and peaks in January. The cheapest month is May, where the average price is $478 as of February. 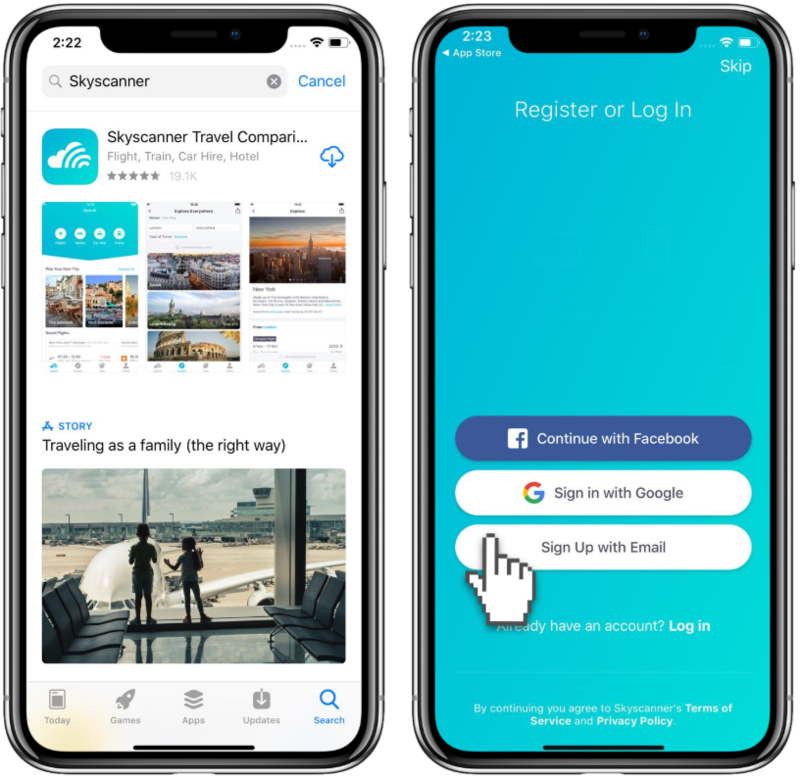 To find the best Malindo Air promos, start off by downloading the Skyscanner app on iOS and Android. 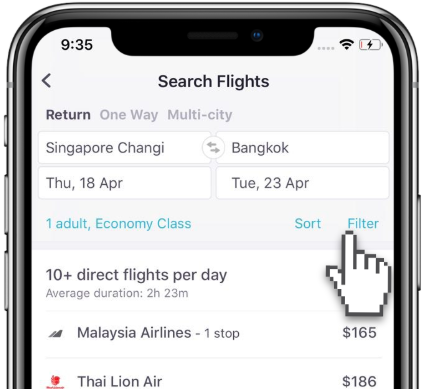 Simply use the airline filter on the Skyscanner app to find Malindo Air promotion flights. 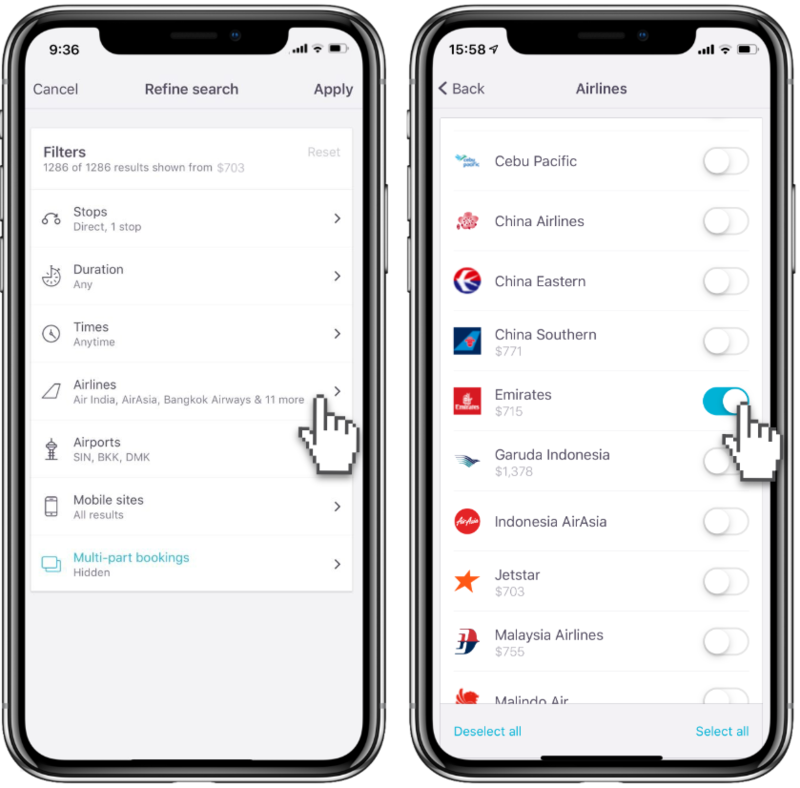 Begin by choosing your destination and dates, and then tap “Filter.” Choose Airlines, and then choose Malindo Air. 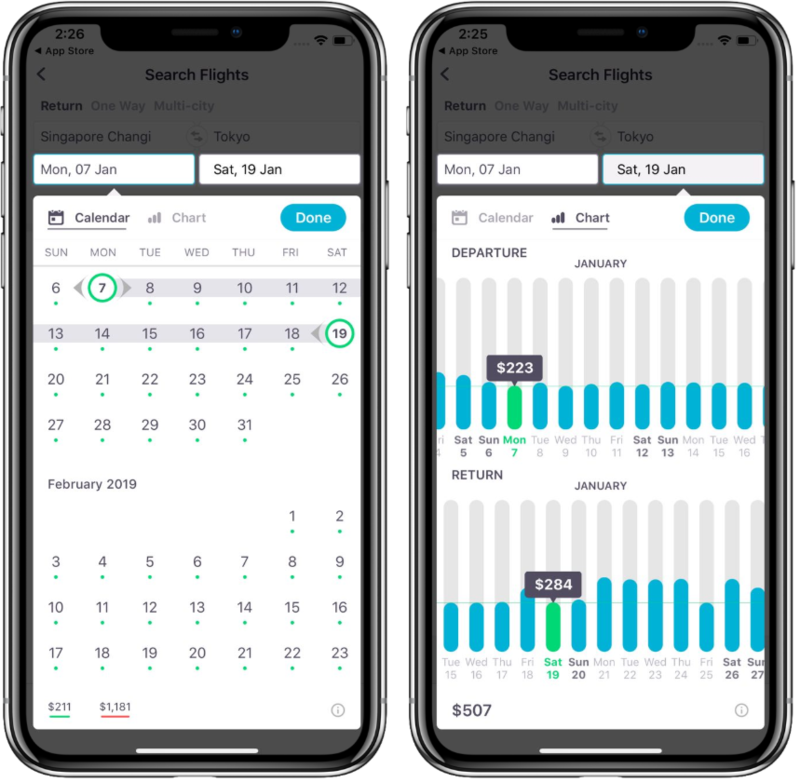 Get the most of any Malindo Air promotion this 2019 by using the Calendar View to quickly find which dates are the cheapest.